We started Just Us Books, Inc. in 1988 to publish more books for children that focused on black experiences. Writers and artists such as Virginia Hamilton and Arnold Adoff, Eloise Greenfield, Patricia and Fred McKissack, Tom Feelings, George Ford, Leo and Diane Dillon, and of course Walter Dean Myers, had already blazed a trail as book creators that we would follow. We were novices, in a way, learning the business of publishing on the fly. Cheryl and I were somewhat brash, bent on making a difference, determined to correct the injustices we saw in publishing. One would think that Myers and the other trailblazers who had been at the forefront of the struggle to change publishing to be more reflective of who we are as a nation, would have been taken aback by the two new kids on the block. But they were not. They embraced us and welcomed us. When Cheryl and I did a radio interview with Tom Feelings in 1990, Just Us Books had only published three titles. Tom was already an established artist, a celebrity really. But he treated us as equals, applauded our efforts and encouraged us on the airways. We received support and encouragement from the other trailblazers, too. Tom is gone. Virginia Hamilton is gone. Leo Dillon and Fred McKissack are gone, too. And now we have lost Walter Dean Myers. I will miss seeing Walter at Book Expo America, ALA, NCTE and the many other conferences where he often held court, sharing, urging, encouraging, directing, advocating…always trying to make things better. When Walter’s article, “Where Are the People of Color in Children’s Books?” appeared in the March 15, 2014 issue of the New York Times, many welcomed it as timely and much needed. But Walter had written an article that appeared in the New York Times in 1986, addressing the same concerns. He was always at the forefront, involved in many initiatives, some that he organized himself. He was determined to increase diversity in our body of literature for children. He also advocated for the inclusion of people of color in the offices of publishing houses. In 1991, Walter, Cheryl and I worked together as jurors for a scholarship competition organized to identify talented writers and artists of color and introduce them to the publishing community. The fellowship competition was a part of Multi-colored Mirror: Cultural Substance in Literature for Children and Young Adults, a conference sponsored by the Cooperative Children’s Book Center (CCBC) at the University of Wisconsin in Madison. Walter also supported literacy programs offered by the Children’s Defense Fund, sometimes donating his own money. I watched as he connected effortlessly with the young people who attended the summer sessions there. Whenever a speaking engagement was set up for him, Walter made sure that juvenile detention centers, prisons and other programs for youth were included. Yes, Walter Dean Myers was a prolific, multi award-winning writer. As stated on his web site he “touched so many with his eloquent and unflinching portrayal of young African-American lives.” Walter visualized a better world. In the tradition of Frederick Douglass, he used words to encourage, empower, challenge, advocate and agitate for the change that would bring that world about. In that regard, for me, at least, he was a freedom fighter, too. Sharing our stories had real meaning. 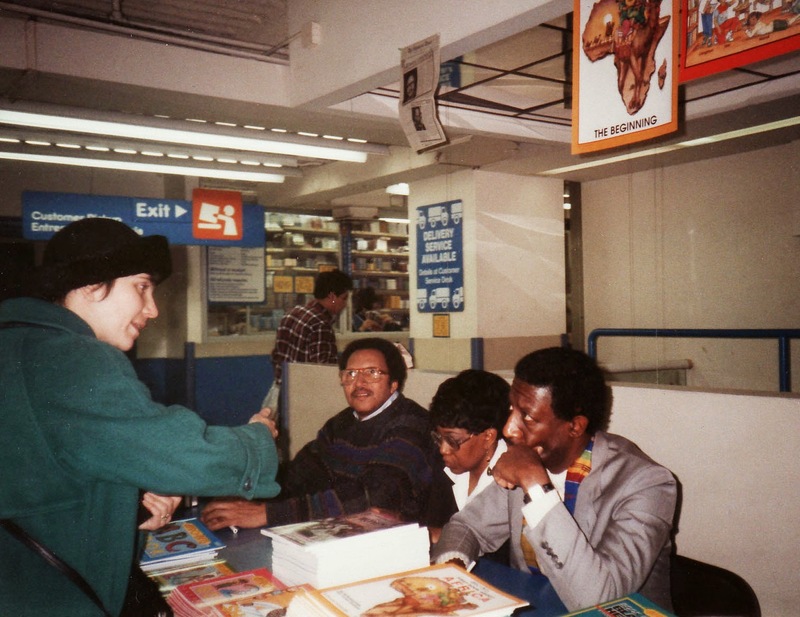 Here, Walter, Cheryl and I are at a 1992 book signing held at a Toys R Us store in Manhattan, NY. This is excellent Wade I shared this on the AALBC.com Blog too: http://aalbc.it/ruhappier?